Above you can see a stunning 1974 5 cent that has a second strike about 75% off centre from the first. Keen observers will also note that the second strike on the obverse shows part of the 5 cent reverse design. The second strike on the reverse by contrast, shows some remnants of the first strike but is largely blank. This peculiar appearance is quite distinct from what is a normal off centre double strike such as the 2008 or 2009 double struck $2 coins that first appeared a few years ago. The second strike on those $2 coins is an off-centre duplicate of the first, obverse to obverse and reverse to reverse. What can we learn from the appearance of the second strike? Firstly, with the second strike showing reverse design elements on the obverse of the first strike we’re looking at what is known as a “flip over double strike”. Which is exactly as it sounds, the coin has flipped over in between the first and second strikes. Secondly, the relative lack of features in the double struck region on the reverse of the coin indicates that there was a coin blank in between the error coin and the reverse die when the second strike occurred. Having been struck the second time with another coin blank in the die press means the second strike was a much higher pressure than a normal strike, and this has completely obliterated all evidence of the initial strike on the obverse (LIZABETH). 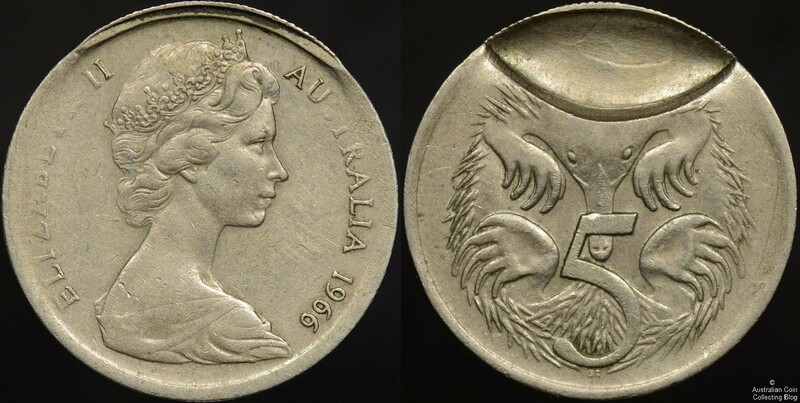 Compare this with the double struck $2 coins mentioned earlier where evidence of the second strike is usually quite obvious in the double struck regions of the coin due to the lower pressure of the second strike. Of course the year is wrong and it’s not the actual coin that mates with our 1974 flip over double struck error above, but that’s pretty much what the other coin would look like, it is of course an indent error. Indent errors and off center double struck errors like the coin we’re talking about here fit together to form what is known as a “saddle strike”. Decimal indent errors are rare, off center double struck coins rarer again, and having a matched pair as a saddle strike is almost unheard of. We’ve heard of less than 5 matched saddle strike pairs in the last 15 years and never actually seen one in hand to be able to take an image of one. That’s how rare they are. The best we can offer is the image below, of a 10 cent saddle strike pair that appeared on eBay 4 years ago. These are the seller’s images and credit must go to that person for them. There you have it, an off center flip over double struck 5 cent from 1974. Extremely desirable and a fine addition to any error collection. And one half of a pair of errors that would be the magnificent centre piece of error types.